No new classes will be offered at Greece Community Ed in the Fall 20ll semester. However I am available for individual instruction and can be reached at al@rochester.rr.com . 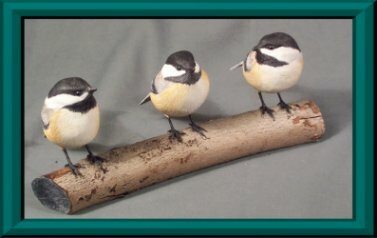 This is a site dedicated to carved birds. You can view photographs of my carvings in the gallery . You can purchase or arrange a commission for any work shown in the gallery by selecting the "e-mail me button." Occasionally you will be able to bid for my birds at eBay or Amazon.com . To learn more about me take a look at my Bio . I would be pleased if you sign my GuestBook while you are here. Check the What's New page for information on classes. This site made and maintained by Al Adaskin and Steven Dennett . Buttons by The Humble Bee. All rights reserved.